This LED 7W in-ground light is 12 Volt AC or DC is stocked in Vancouver, BC Canada. Smaller in grade lights are also available. Contact us for specs. In-Ground LED Light, our newest in-ground super bright LED light draws 7 watts of power, has 465 lumens in warm white light or 510 lumens in white 5000K light. You can direct the light to project upwards or within a 30 degree angle for directing the light at desired landscape features. This fixture include a cULus listed (CSA and UL Listed) 7 Watt LED light engine. 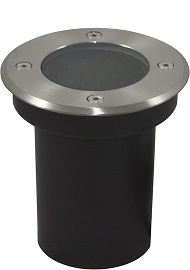 Fully sealed output lead that is 24"
Used to show off architectural features, including, retaining walls, trees, columns and other outdoor applications.